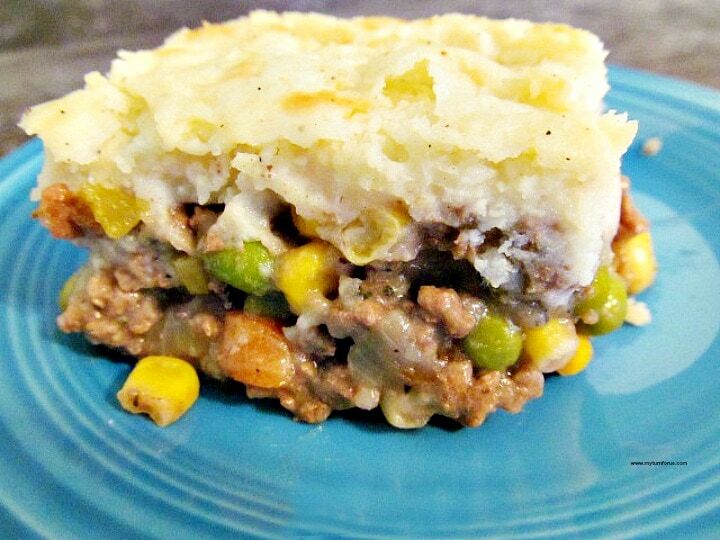 Make this Shepherd’s Pie with Mashed Potatoes that is a Healthy Makeover Shepherds Pie. This Healthy Shepherds Pie Recipe is our version of a light Shepherd’s Pie. We are living a healthier lifestyle and are reaping the benefits, but we are refusing to give up all the food we love. We are taking some of the best recipes and seeing how a few changes can make them lighter and healthier. You don’t have to make huge changes in a recipe to reap the benefits of a healthier dish. A few cuts here and there all day and it adds up at the end of the day. Shepherd’s Pie is one of my hubby’s favorite dishes and we do wish to enjoy food but we need to watch those extra calories. So we need to come up with a light Shepherds Pie. It has been a fun challenge in finding and revamping some of our favorite dishes to make them lighter. And to do it in a way to leave in all those great flavors but only get rid of some extra calories. So it’s our challenge to come up with Healthy Makeover Shepherds Pie. And we wish for it to be a shepherds pie with mashed potatoes. There are a few ingredients that we are not willing to give up in creating a Healthy Shepherds Pie Recipe. We use low-fat cheese and milk in this light Shepherds Pie recipe and added a few extra veggies. But with a few changes, this Heathier Shepherds Pie recipe makes a light shepherds pie that is lower in calories and fats. And it will be welcome on your table with all the flavor intact. In a covered 2-quart saucepan place potatoes and add enough water to cover, heat to boiling on high. Reduce heat to medium; uncover and simmer 18 minutes or until tender. Drain well: return the potatoes to the saucepan, add milk, cream cheese and 1/4 teaspoon of the salt and 1/4 teaspoon black pepper. Mash until smooth. Heat large skillet on medium high heat, add beef and 1/4 teaspoon of the salt and 1/4 teaspoon of the black pepper, cook about 5 minutes or until browned and cooked through, stirring and breaking up the meat. With a slotted spoon, transfer beef to a large bowl. Add wine to veggies, cook for about 2 minutes, stirring to incorporate brown bits from the pan and until reduced by half. Add peas and corn and combine well. 10. In a 3-quart baking dish, add beef and veggie mixture and spread evenly. 11. Top with the mashed potatoes and spread to cover the beef and veggies. 12 Bake for 25 minutes until top is golden brown. 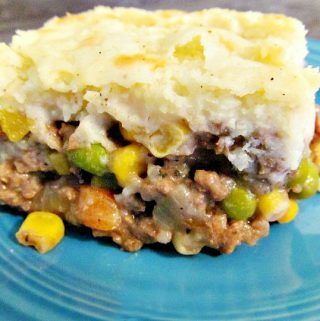 Hi, my family loves shepard's pie and this looks so good.I saw it on tried and true recipes. Looks yummy ! Must try this, I only cook healthy meals. Thank you for making it healthy for us. My poor tummy can't take lots of heaviness(fat). This looks so easy and warm. I love Shepard's pie. While living in England, that and kidney pie were my favorite meals. Well so was fish and chips. lol! I often used ground turkey instead of ground beef. Yours looks yummy! My boyfriend would love this! Thanks for sharing!! Love shepherd's pie! If I can make it healthy then it's even better! I recently made them with mashed sweet potatoes — I just boiled them in some chicken broth to help make them more savory. Yum! Thanks for the recipe, I'll be sure to try these. Great way of making this healthy. Thanks for sharing at Simple Supper Tuesday. My husband loves shepherd's pie. Thanks for sharing! Yummy! What a good way to save a lot of fat and calories. Yum– we love shepherd's pie. I just found out however that my body doesn't like potatoes like I thought it did– no more for me. Definitely worth trying! I probably would substitute ground turkey for ground beef, but this is really tempting. One of my favorite dishes! Love the spin you put on it. Thanks for sharing at LOBS! Our family loves shepherd's pie! My husband is from the UK so it's a bit of home for him. Pinning it! And your retirement dream is ours too. We're a ways off but we'd love to tour the country in a big old RV and thank you for your years of law enforcement service. And for linking up at All Things Pretty! Mmmm, this reminds me of my mum's recipe! Delish!